As hospitals struggle to keep up with growing needs of an aging population, many are at least looking at how virtual healthcare can save time, cut costs, and lead to patient-driven outcomes. 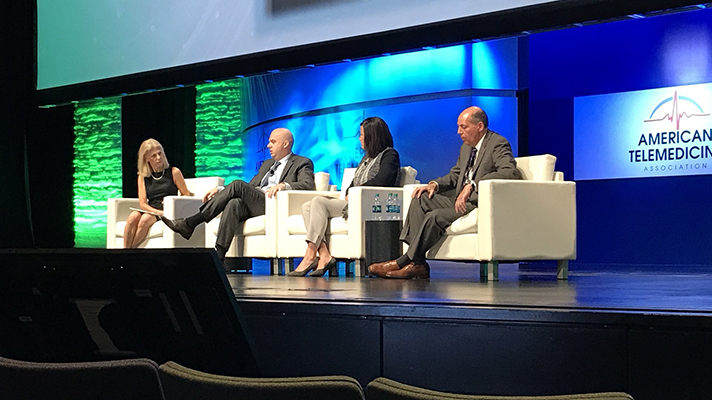 At the American Telemedicine Association Conference in Chicago earlier this week, industry players sat down to talk emerging trends in virtual care and where they see it in the future. Here comes the Silver Tsunami, where there will be fewer caregivers to provide for a growing number of patients. Safavi pointed out that a behavioral health platform could be used to help therapists treat more patients. While industry insiders are excited about how telemedicine and virtual medicine could help impact the system, there is still the reimbursement hurdle, which has been a notorious struggle for telemedicine. But some experts are saying not to wait around for payers to figure out the reimbursement. Virtual healthcare, however, has left payers and providers struggling to figure out what a payment model would look like for this service. Typically a patient sees a provider and the provider is reimbursed in the classic fee-for-service model. But in the future virtual health could shake that idea up. While the industry continues to evolve, new players like Walmart are jumping in the healthcare field, which could also disrupt the status quo. These entries, not to mention Amazon, Apple, IBM, Google and Microsoft, could propel the traditional providers to change the way they offer care to become more consumer friendly and, incidentally, more tech-friendly. While no one denied that relationships with clinicians are important, so is convenience. “I think what we don’t understand and what these new entrants do is that when a person wakes up in the morning and doesn’t feel well, what they really want is to understand what their problem is and to figure out how to treat it — not to see a doctor. However, the provider view is what they want is to see a doctor,” Safavi said. But healthcare can learn from other industries about evolving with technology, according to Hubler. She noted that when Netflix came into the video industry people didn’t know what would happen to actors. At that point, reality TV was on the rise and many were saying it was the death of the acting profession. But Netflix not only innovated a better way to watch shows, she said, it produced new content and gave opportunities to actors. While there are still a lot of questions about what virtual healthcare in the future will look like, there is no question that virtual care will eventually arrive. “The culture is slowly starting to shift in favor of digital and in favor of technology,” Smith said.